So, we meet again the Nokia 5250. This time there are better photos, actual official specs and price too. The Nokia 5250 will cost a bit over a 100 euro - it's not the coveted 100 euro smartphone but it comes pretty close. The Nokia 5250 has a rather modest specs sheet - it runs Symbian^1 (a.k.a. the regular Symbian S60 5th edition) on a 2.8" TFT screen with nHD resolution and relies on quad-band GSM/GPRS/EDGE for data connectivity. The Nokia 5250 sports a 2MP camera on the back of its 104 x 49 x 14 mm body. The battery is quoted at 18 days of standby, 7 hours of talk time and 24 hours of music playback. There's no 3G or GPS connectivity (like the Nokia 5230 has) and no Wi-Fi (like the Nokia 5530 has). 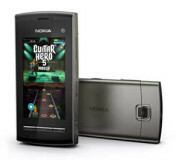 It's simply a more compact version of Nokia 5233. Honestly, that limits its smartphone potential quite a bit and the Nokia 5250 will probably have to fight quite a bunch of touch feature phones for a place under the sun but it will surely go mass market, that's for sure. The Nokia 5250 will cost 115 euro (145 US dollars) before taxes and subsidies and it's expected to start selling in Q4 this year. Oh, and it will come with Guitar Hero 5 Mobile for what it's worth.